It's been another busy week at university, with assignment deadlines and getting back into the swing of prep for classes. We have been learning more about research this week as we begin to think of our research proposals... It still feels quite scary to think we have to think up our own ideas for research when we are just begining to get our head around the complexities of occupational therapy. Thankful to have a knowelegable lecturer who is head of research at the university to share with us on different forms of research. This week has given some of us time to reflect on the course so far and it's been good for me to think about the positives of studying the MSc at UoC. If you are a reader of my blog, you will know I havent found the transition to masters level plain sailing... But thinking back now, if i had the choice between the BSc and MSc. I think I would still choose to do the master course. 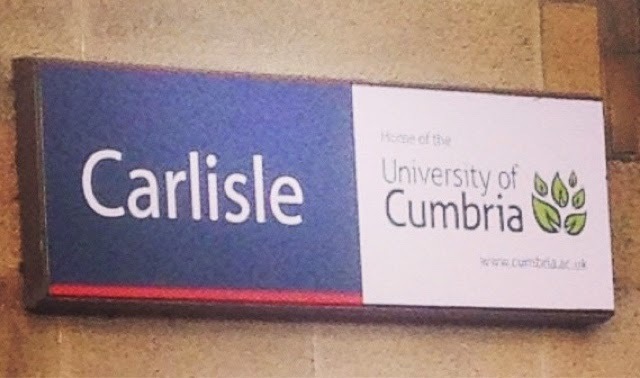 The campus in Carlisle is small, and so is the course. This means you get to see the tutors around the building most days and they are really helpful. I've found that my personal tutor (PAT), is fab for advice and support. Im sure the other tutors are too. The course teaches you to be independent and search for information to aid your and others in the class' learning. This is a skill we are still getting our heads around 5 months in, but I know these skills will be crucial as we become qualifed OTs in the work place. The tutors also place a big focus on research skills which as OTs working with evidence based practice. It is important we can recognise where to look and how to critique what we are reading to guide our practice. The majority of the OT staff are involved in research of their own or are studying towards qualifications such as PHDs; they also have a great depth of knowledge about practice - just need to seek it out of them! The course benefits from having guest OTs from practice, come in to teach the students. As a first year we have only had a few as first term is quite theory heavy, but i'm told you get a lot more in second year. The university benefits from fab student support services - the library staff are so knowledgeably, and always willing to lend a hand when you are feeling lost with referencing, finding resources as well as most other things you might need support with. Currently i've only had 2 placements - an observation week and a 5 week one; but looking at the range of settings and locations we have had as a class; there seems to be a good range. I think the normal intake is around 27 a year which means you really get to know your class mates and have a chance to learn from each others experiences. Im sure there are many more positives I haven't thought about. But at least there is a few to get you thinking about why studying a MSc at Cumbria is worth it. This post is very purposly one sided, as I feel that as student OTs it is important to focus on what people can do and not what they can't. With all courses there are things we might want to change and as human beings we can't all like everything... But I think the positives do out weigh the things that arent ideal for me and I wanted to share those!! Yeah we are lucky its a funded course too. There will be so many people who would love a funded course but can't get on one.